INTERNET! WHAT IS WRONG WITH YOU? GET IT TOGETHER, PEOPLE. The beautiful and amazing agglomeration of talent known as Solange Knowles recently had an interview with Concrete Loop, in which she discussed many topics. One such topic was how she deals with the negativity that all the untold denizens of the Internet feel so fond of spewing. "I've always been a part of a very accessible kind of movement of technology. I was on Twitter very early on. I don't know, a part of me just kind of turns an eye to it, and a part of me really feels like the humanization of artists has really just been stripped down. One of the reasons I went off of Instagram — because I was on there for a little while — is because, you know, I would post pictures of my son or my friends, and they'd be criticized. My whole thing is that I'm completely, fully capable of handling negativity for myself. But to put that kind of access to negativity behind people who didn't even ask for it was really troubling to me." "[Social media] was really a pivotal thing for me, because I was at a label. I put this album out that was completely and wholly a body of work that I was super proud of. But then, on the marketing side of things, the promotional side of things, I was having a daily fight on every decision… and so Twitter was really resourceful for me, because I was able to sort of supply that stuff directly, and I think that was a real turning point in my career, when people were able to get access to who I was and what my interests are and how I spoke." Angel Laws, the interviewer, remarked that Solange isn't afraid of going on Twitter rants (she really isn't), to which Solange slyly responded, "I have to. That's how I keep my sanity." 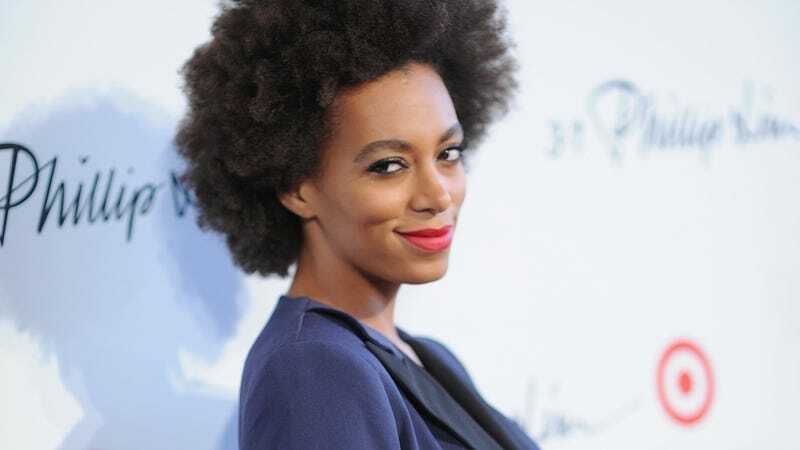 Solange Chops Hair, Is Called "Insane"
Solange also discussed the recording process for her upcoming album. She has plans to record in Ghana in a couple of weeks, but she's mostly recording in New Orleans and New York. "I think it's so important for that writing space to be in different environments and cultures," she said. "A lot of this album actually deals with a lot of social issues, a lot of black issues, and where better to really feel the heart and soul of that then where I'm from?" Thank goddess that the world has such a remarkably talented woman creating such a perfect antidote to all the vapid pop music in circulation now. UPDATE: Solange's publicist has informed us that Solange has a new Instagram account, SaintRecords.